The last reading in the Book of Genesis starts with Jacob’s farewell message to his sons, describes his death, and concludes with the death of one of those sons, Joseph who survived his brothers’ hostile treatment to become the deliverer of the family. 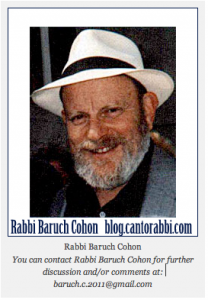 Generally, the Torah recounts the end of life in proportion to the importance of the individual. Many of the early figures in Genesis are described at their end quite tersely: “He expired,” “He was gathered to his people,” or just plain “He died.” As the last of the Patriarchs, Jacob can be expected to command ample treatment, and he gets it in this passage. He first swears Joseph not to bury him in Egypt but to take his body to the Cave of Machpelah – the place Abraham bought to bury Sarah, the place where Isaac and Rebekah lie, the place where he buried Leah – the same cave in Hebron where Jews still visit to honor our ancient history, the same cave that our enemies try to steal in order to deny our connection to the Land of Israel. Jacob continues by blessing Joseph’s sons, Ephraim and Menasseh, even reversing their order over their father’s protest. As they approach their dim-eyed grandfather seated on his bed, Joseph guides Menasseh to Jacob’s right, Ephraim to the left. But Jacob can see well enough to recognize the boys, and he crosses his hands to place his right hand on Ephraim’s head. “I know, my son, I know,” Jacob replies. “He will also become a people and will grow. But his younger brother will outgrow him, and will become m’lo hagoyim” – (literally “the fullness of nations”) which Rashi interprets as a prophecy that Ephraim’s descendants will include Joshua the conqueror of Canaan. Then Jacob proceeds to give his last message to the rest of his sons. Not really a blessing, this message is more of a judgment on their characters, based on their behavior. Some show promise, some are plodders, others get specific charges. Reuben loses the privilege of the firstborn because he once bedded his father’s wife. Judah, by contrast, proved himself a leader and gets acknowledged as such. No mention of his little intrigue with Tamar. Again, the commentators link this praise of Judah to the future: he will be the ancestor of King David. So Jacob completes his message to all his sons before putting his legs back in bed and breathing his last. It is Joseph who weeps over him, kisses him, and then orders his body embalmed. Commentators point out that this process will take 40 days, to prepare for the journey to Hebron. And we are told that the Egyptians added another 30 days to the public mourning period for Jacob, whom they credited with bringing on the end of the famine. That gave him almost the same importance, in death at least, as the Pharaohs – 70 days of mourning. Royalty received just 72. After the sad journey and the burial, Jacob’s sons again voice their concern about how Joseph will treat them now. While their father lived, they enjoyed peaceful relations with their now-powerful brother. Now will he at last take revenge for their cruelty to him when he was young? They quote their father as sending a message to Joseph through them: “Forgive the sin of your brothers.” Joseph reassures them, telling them “You thought you were doing me wrong, but G-d intended it for good.” And he continues to provide for them until he reaches the age of 110, witnessing the birth of his great-grandchildren. Just one sentence. Not two chapters like Jacob. No extended messages. Not even a spot in the Cave of Machpelah, just a roadside tomb that modern enemies virtually destroyed. Was Joseph not important? Quite the contrary. While this obituary stands out as among the briefest in the Torah, its subject dominates the last 13 chapters of Genesis. What Joseph experienced and accomplished in his life hardly needed review. Like all others in the Hebrew Bible, Joseph gets no promises of a heavenly future, but neither we nor his surviving brothers need any reminder that he alone made the rest of Jewish history possible. What more could be said? The old “March of Time” radio show had a formula for reporting someone’s death: “This week, as it must to all men, death came to …..” Indeed every life comes to an end. And we know about death and taxes. We remember people for their lives, not for their deaths. Perhaps that is why Torah sections that describe the death of important people have titles like Hayey Sarah – The Life of Sarah, and here Va-y’khee Yaakov – Jacob Lived. So may it be said of us all. This entry was posted in Jewish Blogs and tagged Blog, Cave of Machpelah, Death, Genesis, Israel, Jacob, Jacob's Blessings, Jewish Blogs, Joseph, Joseph Lived, life, Rabbi Baruch Cohon, Sedrah Va-y'khee, Torah, Torah Blogs, Torah Study, Va-y'khee, Va-y'khi, When Life Ends. Bookmark the permalink.